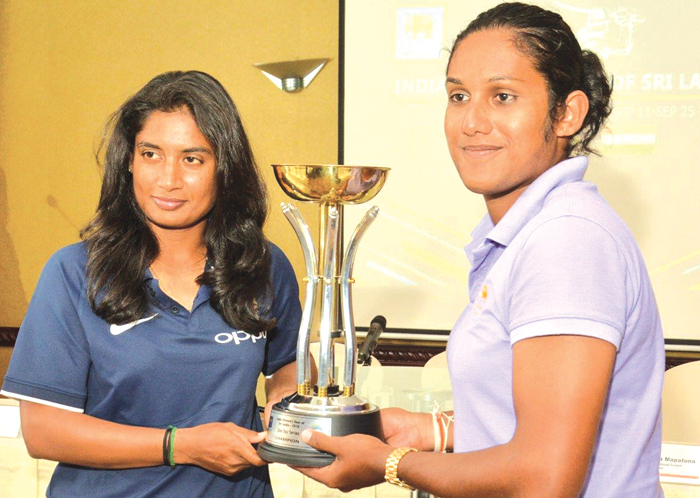 Rival captains India’s Mithali Raj (left) and Sri Lanka’s Chamari Atapattu pose with the trophy that will be awarded to the winners of the three-match ODI series between the two sides. Sri Lanka Women cricket team captain Chamari Atapattu said that rankings don’t mean a thing and that she was confident her side would put up a good contest against India in the upcoming three-match ODI series and five-match T20I series. The ODI series commences at Galle on Tuesday. De Silva who has returned as coach of the women’s team after five years in Australia said that his work has been made easy because out of the pool of 24 players at least 20 were there in 2013 when he last handled them. “It is a big advantage to me because I had worked with these girls before. I could see a lot of talent skill wise and there is a lot of talent to work to take them forward. We have done 3 weeks of training for this series and I am extremely happy with our preparations,” said De Silva. Indian women’s captain Mithali Raj said that she was positive about the performances of her team on the field. “We have played Sri Lanka in the Asia Cup and World Cup and we feel that it is a team that has grown from year to year. Now the gap between top teams and bottom teams are narrowing because of the ICC championship tournaments,” said Mithali.